DeerSmart is a unique, clean and professional WordPress theme perfect for promoting and selling your products online. The theme offers unlimited color and font options, 25+ powerful shortcode, 08 header layout, 08 awesome sliders, custom widgets and a lot more. Its framework is built with Bootstrap 4, which provides an effective and user-friendly timeline component. It is created with clean and valid code, which makes the theme fully responsive and functional. 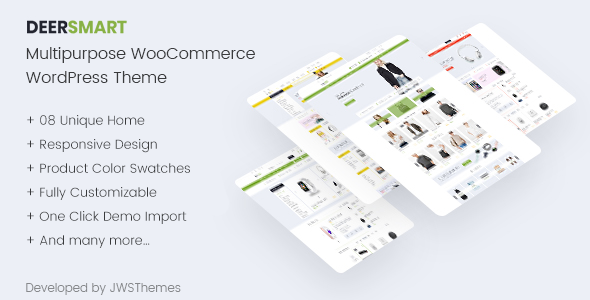 DeerSmart is a suitable theme for creating eCommerce and portfolio sites. This theme is available in 08 different homepage layouts to help you pick the page layout that best suits your business needs. Let your eCommerce website standout by changing the color scheme and font of your website.